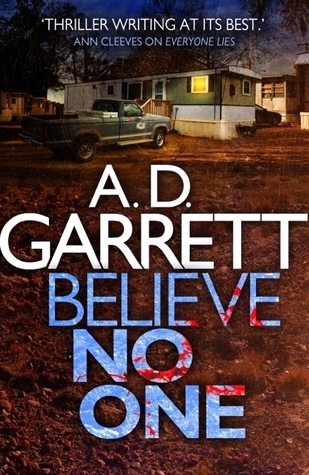 Authored by A.D. Garrett, the collaborative pseudonym of award winning author Margaret Murphy and renowned forensics expert Professor Dave Barclay, Believe No One is the second gripping crime fiction installment to feature DCI Kate Simms and Professor Nick Fennimore. UK Detective Chief Inspector Kate Simms is on a six month ‘method’ exchange with the St Louis PD when her cold case team uncovers evidence of a serial killer dumping bodies along a 600 mile stretch of the I-44. For Professor Nick Fennimore, touring the Midwest promoting his latest book, it is a convenient coincidence that a case he has been invited to consult on in Oklahoma, concerning a murdered woman and her missing child, links with Kate’s investigation. As the ad hoc task force involving Simms and the St Louis PD, Fennimore and the Williams County Sheriff’s Office, the National Center for Missing & Exploited Children and an FBI Behavioural Analyst get closer to identifying the killer, they discover a link to a crime that happened more than two decades before, and a world away. Fennimore is stunned by the possibilities given his own tragic loss, and with another body of a young mother and her child missing, he isn’t about to let this killer get away. Part police procedural, part thriller, the third person narrative exposes the perspectives of the investigators, the killer and a young boy running scared. I really enjoyed seeing the case come together through the hard work and persistence of the officers despite political maneuvering from a boorish local sheriff and the occasional inter-agency skirmish. I felt Kate got a little lost within the cast though I did like her colleagues, particularly the gruff Ellis. Abigail Hicks was an interesting character as well, and I was surprised to learn that deputy sheriffs receive so little training or support for their role. The killer is suitably creepy with an interesting pathology and surprising motive. Some of the scenes involving the torture of his victims are disturbing, but thankfully are mostly light on details. ‘Red’ is the nine year old son of one of the victims who escapes the killer but is too afraid to go to the police. I felt both sad and afraid for him and I’m still not sure how I feel about t he unusual situation he winds up in. The personal lives of the feature protagonists, Kate and Nick, matter within the context of the story too, though it is Fennimore’s history that is more relevant. Five years ago Nick’s wife and daughter were abducted and while his wife’s body was recovered in a marsh, his daughter has never been found. Fennimore is convinced she is still alive and the similarities between this case and his own tragedy has him on edge. Meanwhile Simms accepted the exchange in part to escape Nick and their complicated dynamic so she isn’t thrilled when he involves himself in the investigation. With a complex plot and interesting, well developed characters, Believe No One is an entertaining and exciting novel. 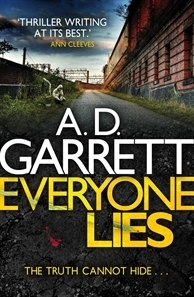 Though it conceivably works as a stand alone I would recommend reading Everyone Lies first. Thanks for sharing. I hadn’t actually heard of Garrett!